Performing Arts Centers hold a place of strong cultural connection and value in the communities that surround them – be it cities, universities or private institutions. They are also notoriously difficult to manage with multiple events, shows, and gatherings being planned and executed simultaneously. One of the biggest challenges we face as managers is scheduling the seemingly endless (yet somehow always limited) number of venues and spaces in our facility. Here are several variables at play that must be considered when scheduling. Unfortunately it’s not enough to simply say “The show is in Theatre A this week”. You may have multiple groups sharing the same performance hall or rehearsal space on the same day. An upcoming show might need to schedule a walkthrough. You may also have one group using several of your spaces simultaneously with music rehearsals in one room and technical rehearsals in another. There will also be scheduling needs not related to any one particular event. Sometimes your staff may need access to room for activities ranging from maintenance projects to board meetings. These rooms may also be in use by current shows further complicating matters. We must also take into account areas of the building that are not official “venues” such as the loading dock, lobby, scene shop, and dressing rooms. These areas are often overlooked but need just as much (if not more) coordination than your traditional venue spaces (theatres, concert halls, breakout rooms, rehearsal spaces, etc). In larger facilities there is an endless stream of deliveries, pickups, load-ins, and load-outs that will create all sorts of bottlenecks. Finally, it’s not enough just to create your complicated schedules. They must also be distributed to the multitude of staff, freelancers, internal departments, incoming artists, volunteers, and others who need to know what’s going on around the place. Many different departments (programming, production, education, students, volunteers, and marketing teams) all might be working in overlapping spaces. Performing Arts Centers necessitate a large number of people and groups, all working together. Ensuring everyone knows what is going on is of utmost importance. 5) Oh yea, and details are changing on an hourly (if not minutely) basis. So there’s that too. The key to solving this challenge is recognizing the need to view scheduling information from different vantage points. We must be able to switch instantly between a venue’s schedule, a show schedule, and a department schedule without the busy work of creating, maintaining, and updating independent documents. We must also generate schedules specific to the needs of the various groups we are charged with communicating with including internal departments, facilities, guest artists, crew, and upper management. We’ve all seen first hand the consequences (and financial impact) of schedules mixups. 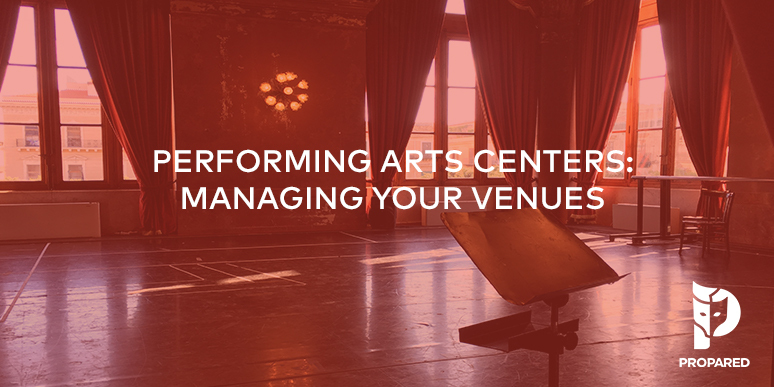 A performing arts center is a complex system of moving parts, and we know it takes more than a spreadsheet to make it sing.